So I’ve been thinking about student engagement and empowerment. A few weeks ago I wrote about technology’s ability to add sparkle and perhaps encourage students to lean in to a topic. My original post was about engaging students partly because it began from some frustration with technology resistors. In particular I was thinking about folks who resisting tech integration on the grounds that technology adds fun and fun is bad. I had some conversations with others, via the comments and Twitter, that are the basis for this post. In a comment of my previous post, Philip Cummings (@Philip_Cummings) made the very good point that engaging isn’t always enough. I worry that too often we take stuff that just isn’t engaging to kids and try to infuse it with technology in order to engage them. For example, grammar drills aren’t going to become magically engaging just because you ask kids to do them on an iPad. Engaging learning is purposeful, meaningful, and timely to the learner. It connects with their passions and interests; the learners must think it matters (and not just for the test on Friday). My school is 1:1 with tons of technology-infused into lessons, but students still aren’t always engaged. The shiny might help for a little while, but I think it wears off fast. I totally agree with Philip as I said in my reply to him. I was making a case, though perhaps not very effectively, for including technology as one of the ways teachers try to encourage students to lean in to a topic–as a hook to real purposeful learning not as a flashy cover for boring rote stuff. Then on Twitter I had a conversation with Christina Brennan (@christybrenn) The key word in that conversation was empowering. I think both of them were talking about the much bigger and more significant step of empowering students with technology. Again, I totally agree. (I was back there being frustrated about who was taking the very first step.) My big picture goals for students’ technology use include empowerment. Faculty believing that technology might help to engage students in meaningful work is a start and only a start. Setting a goal of using technology to empower students is much more impressive, important, forward-thinking, and interesting. And, let’s face it, maybe terrifying. So, I started with the less threatening engaging. But is it less threatening a reasonable early step or is it a side step that doesn’t really get us on the path to empowerment? So, I’ve been thinking about Macbeth recently. I am teaching a section of 9th grade English this year. Currently we are reading Macbeth, and it’s hard for many of the students. As we go slowly and carefully through the original text even my class of 16 can seem too large. I need to have a small group looking closely at a given passage, and often I need to be involved in this close examination. Since I cannot read my students’ minds (and thank goodness for that!) one of the best ways for me to know they are engaged is for them to speak up. However, only 1 person can contribute to a discussion at a time if we don’t want chaos. Enter back channel chat. This is a strategy I have used before in 5th grade. So the issue that I was trying address was participation. I want more participation from more students. I want a little more of a peak into their heads, on the limited topic of Macbeth. I want to provide other modes of participation. I want to de-emphasize speed and quickness. Sometimes in conversations the topic moves quickly and leaves some folks out. 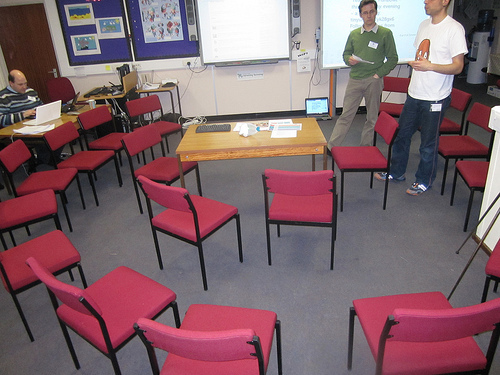 Here is a room set up for one type of fishbowl conversation. What I noticed was with a smaller group in the fishbowl, more people participated. No surprise there. However, adding the Todaysmeet option is what really makes this a winner. Typing provided a different format for participation. Several people could comment “at the same time” since they were typing. No one was interrupting each other. It was a perfect format for those “I agree” comments that say I am listening and engaging but might not have something new to add here. Students who would never interrupt to add something, had a lot more say (type) than usual. Repetition wasn’t such a problem. I could go back over the transcript later. I got more information about who was thinking what. I “heard” from a wider range of students (everyone). When it was time to be in the fishbowl, there were also fewer people and more of a chance for each student. Students asked questions that might sidetrack the main conversation and got answers from other students. I swear this happened. And, students asked if we could do this again. They worked harder and wanted to do so again, even if they wouldn’t say it that way. While it’s not necessarily an everyday strategy, I think it’s one to keep. What strategies other strategies increase participation? So, I’ve been thinking about resistance, in particular resistance to integrating technology into class. Honestly, I think about this frequently. There’s the fear thing, the time thing, the kids-will-know-more-than-I-do thing. Another “thing” I’ve been tossing around in my head is the technology-is-fun-and-we-are-doing-serious-work thing. I think there’s something about the trifecta of high level courses, high performing schools, and high-powered students that lends itself to all of us taking ourselves a little too seriously in the classroom. To be clear, I am very serious about education. By that I mean that I believe with my entire being in the power of learning and the transformative potential of students doing excellent work. I believe that students should work hard at school; it should push them intellectually; they should wrestle with ideas; feedback on work should be constructive, honest, and supportive. I think that all students should create work in many forms and actively reflect on their learning. I do not advocate “cute idea teaching” where projects that have no educational value but look great on the walls are the norm. And, in the same breath without contradiction, I am also all for a little sparkle. I want all students to lean in to whatever class they are in. Sometimes that pure form of a subject, however bright and shiny it appears to the teacher who specializes in it, does not look that way to the students. Sure we can take the attitude that “this is good for them,” like vegetables. However, putting our subject matter in the category of things students don’t like is probably not productive. Mixing in a little secret spice to (insert your favorite subject here) goes a long way in terms of adding appeal without watering down. If we can make what we know is good and worthy and valuable a little more appealing to the unconvinced would that be wrong? In a recent blog post John Chubb, President of NAIS (National Association of Independent School) wrote about student engagement. He titled his post “Measuring what Matters: Student Engagement.” So, I’m thinking he’s all for student engagement just from that title alone. He references Ferris Bueller Day Off “Bueller, Bueller. . .” If that doesn’t make any teacher want to weep, I don’t know what will. When I advocate using technology in class to increase engagement, I am never suggesting turning class into recess (see my point about “cute idea teaching” above). But, in some circles fun and even engaging has become a bad word, a word that means easy, not rigorous. Fun and engaging do not mean those things; I double checked. Helping students find a less intimidating and more engaging way into the material or discussion is not making the class too easy. It is meeting students where they are and moving them forward. If by sprinkling a little sparkly technology dust onto what we are doing I can get my students to lean in a little bit more, put forth some more effort, discover this topic is more interesting than they suspected, push them to think, super. I am not above a bait and switch. So many teachers I know are great performers in class. They will dramatize, use funny pictures, joke, anything they can to get help their students see the subject matter in a more possitive light. Why should that stop at technology? Technology is one more tool (actually many, many tools some of which will disappear just when you have fallen in love with them) to add to your bag of tricks. And, let’s face it creating the next generation of (insert your particular discipline here) scholars is not going to happen without students enjoying the subject matter and the work.